It's been a few months since Feel Good Friday focused on animals so today we're going to Thailand to learn about the Boon Lott's Elephant Sanctuary. British traveler, Katherine Connor, was inspired by the courage of a young, very ill elephant named Boon Lott (survivor in Thai) when she was volunteering at an elephant hospital in Thailand. So inspired that she launched an international fundraising campaign to get him the medical treatment he needed and stayed in Thailand to help care for him. When he died, she created the Boon Lott Elephant Sanctuary in his name. As stated on their website, "BLES strives to rescue and protect the elephants of Thailand from abuse and ultimate extinction. We provide a safe home where we focus on individual survival and growth in numbers." With the use of elephants in industry in Thailand ending in 1989, many of the mahouts (people who care for the animals) began using their elephants for illegal logging or tourist entertainment in order to feed their families and their elephants. City life, and often being pumped with drugs, reduces the elephants' life expectancy due to stress and malnutrition. Not only does BLES care for the animals, they also employ local mahouts to work at the sanctuary. Again from the website, "We are deeply committed to our village community and provide jobs and housing to several mahouts and their families. We encourage local participation in BLES activities and promote education about elephants and their plight as well as the environment." Want to get directly involved supporting BLES? 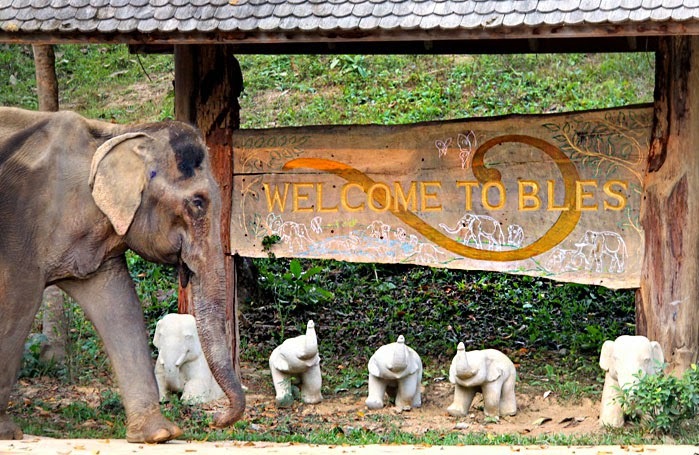 Take a trip to Thailand, stay at the sanctuary and work as a volunteer. With room for only 6 guests at a time, you need to plan ahead since they are currently fully booked through April, 2015!